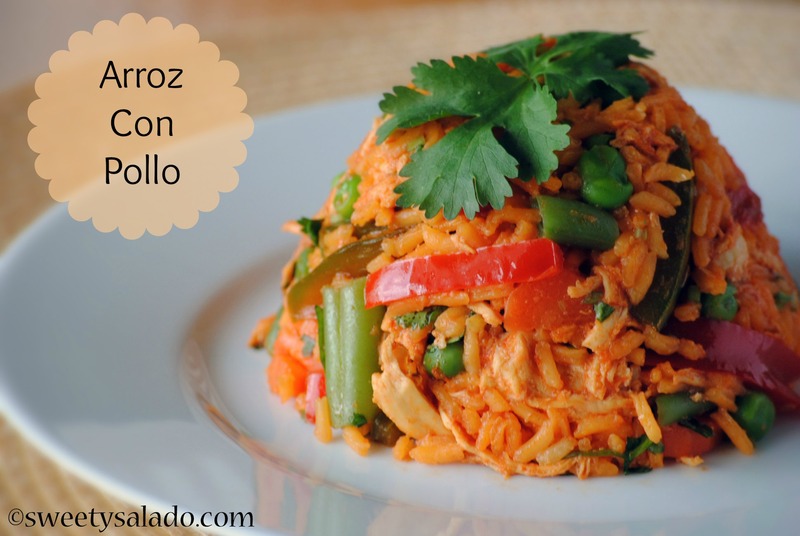 How I love Colombian arroz con pollo and for so many reasons! That aroma of Colombian seasoning that can be smelled from any corner of your house. The vibrant color of the achiote (anatto) and the medley of vegetables is absolutely gorgeous, the picture alone says it all. And the flavor! That flavor! It has a little bit of everything, chicken, seasoned rice, all kinds of vegetables, sauce, it’s simply delicious. And the best part, it’s one of the most inexpensive dishes you can make that will feed an entire platoon. 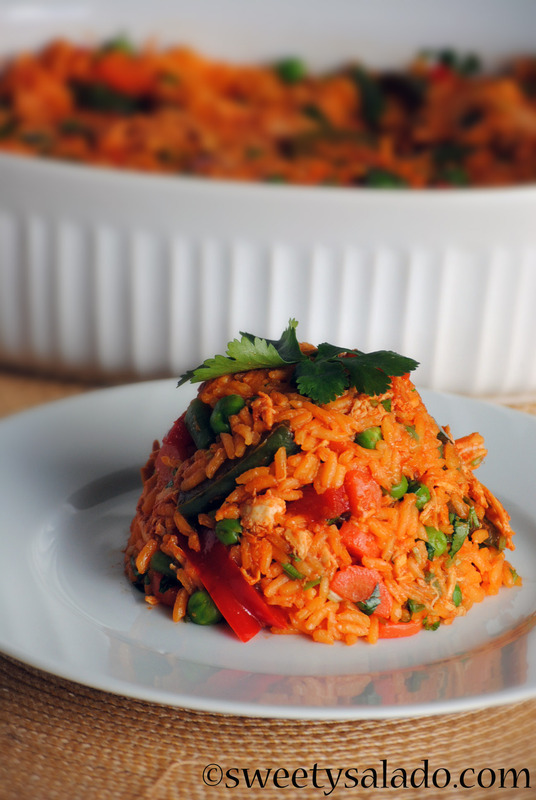 Which is the reason why arroz con pollo is one of the most popular meals that is served at a party where you can expect a lot of guests. A true Colombian has eaten this dish at the reception of a baptism, first communion, graduation and wedding. And that’s why there is an enormous amount of different recipes for the famous arroz con pollo because it’s not only made in Colombia, but all throughout Latin America since in essence it’s the Creole version of the Spanish paella. In the US is very common to make it with chicken thighs and drumsticks that are cooked with the seasoned rice and served the same way. In Colombia we make it a little bit different because we mainly use chicken breasts that are shredded and seasoned well. In recent years I have been making it in different ways, following different recipes and changing several ingredients. The recipe that I’m sharing with you today is the final version that I always make at home. The last touch was adding tomato sauce to the chicken for two reasons, one, to give it more flavor because I noticed that a lot of times the chicken was tasteless and too dry. And two, to add more color because an arroz con pollo with chicken breasts pieces that are white and pale is not very appetizing even if they’re bursting with flavor. But, I want to emphasize that adding the tomato sauce is completely optional, like I said earlier it’s just a little touch I added to the chicken to give it more color and flavor. 1. Cook the chicken in enough water at medium heat for 30-35 minutes. Once cooked, remove them from the pot and let them rest. Reserve the chicken stock to make the rice. 2. To make the rice, boil two cups of the chicken stock in a medium pot, add the rice, oil, Sazón Goya and salt. Cover and reduce heat to low and cook for 20 minutes. Once cooked, fluff the rice with a fork. 3. To cook the vegetables, boil enough water in a medium pot, add the carrots, green beans and salt. Cook on medium heat for 4 minutes. After 4 minutes, add the peas and cook for another 4-5 minutes. Once cooked, drain and set aside. 4. Once the chicken is cool and rested, shred it with two forks and set aside. 5. To make the sauce, put the tomato sauce in a medium bowl, add the cumin, garlic, onion and salt. Stir well and add the shredded chicken. Make sure the chicken is coated thoroughly with the sauce. 6. Heat 1 tbsp of oil in a large pan at medium heat and add the bell peppers. Cook for 3 minutes. Add the salt and Sazón Goya and cook for another 3 minutes or until they’re softened. Add the chicken and cook for another 2 minutes or until the chicken is heated thoroughly. 7. To assemble the arroz con pollo, put the rice, cooked vegetables, chicken and peppers and chopped cilantro in a large serving dish. Stir well before serving. YiKeS! No mi amor! 'dat ain't 'da way my abuela would ever make arroz con pollo! 'Ya gotta' use a pilon to crush the ajo and ya gotta' simmer da' annato seeds in olive oil and ya' gotta' sear da' chickin' thighs and ya gotta' mince in 'sum chopped onions along wit' da' sum' bell pepper, and ya' gotta' use sum' real chikin' stock 'fer starters!And 'dat also be way too much tomater' sauce! And also don't fergit' the pitipois…I is 'jest gonna have to cook dinner 'fer ya sumtime' and show ya' what I be talkin' about! Absolutely, I would love to! Like I wrote in my post, there are a ton of different ways of making arroz con pollo, every country and every family has their own way of making it; some use fresh tomatoes, add onions, olives, capers, use chicken thighs or chicken drumsticks, you name it. But, believe it or not, whenever you eat Colombian arroz con pollo, this is pretty much what you're served, give or take a few ingredients. In most parts of the country, including versions you eat at home or eat at restaurants, this is pretty much the basics of how it is made in Colombia, and what I'm presenting is my version of it. Pretty different, isn't it? Oh and the tomato sauce, again, as I said in my post (did you read it, by the way? ), that's my own personal touch and believe me, it's AMAZING, you should try it. Also, the rice is made with the chicken stock I cooked the chicken breasts in, and as the recipe states and the video shows, there are peas in it as well. Again, did you read the post or watch the video before commenting? LOL, I'm just wondering. I have to be honest, I expect these kinds of comments or any personal messages here on the blog, Facebook or YouTube since people get really emphatic when it comes to any arroz con pollo recipe. It's one of those recipes that is carried from generation to generation and most feel that it has to be cooked a certain way, or their way for it to be authentic, which couldn't be further from the truth. It's a very, very interesting reaction. I'm having such a hard time posting! Grr going to try it today. Your recipes rock! Made your empanadas for a block party and they were gone in 20 min. Keep getting asked when will I make them again! I had this tonight and LOVE it. I did over cook the rice a bit but still delicious. Just made this Arroz con Pollo for New Years eve and everybody loved it! My husband and some friends of mine who are also Colombians said it had the authentic Colombian flavor. Thank you so much for sharing this recipe. I was looking for a good arroz con pollo recipe that was close to my mother's (she is from Ecuador), and this was very very close. I made it yesterday and it was SO delicious! The only thing I wasn't crazy about was I thought the tomato sauce made it too sweet, but I generally don't like very sweet things. I understand that was your personal touch, so maybe next time I will not add as much. It did give the chicken a nice color, though! I will definitely be making this again and checking out your other recipes. Colombian and Ecuadorian food have a lot of overlap so it's awesome to see recipes for some of my favorite dishes! Thank you so much for making it, Jennifer! I'm so glad you liked it. Did you use plain tomato sauce, the one you use for making marinara sauce, or did you use ketchup, which is made with sugar? Some people confuse the two and that's why it comes out sweet. Hi Diana, the printable version of the recipe doesn't work. It printed like 20 pages of the side signs but not the recipe 🙁 Thanks! Thanks for bringing this up to may attention! I just looked at it and it seems that you probably had the English and Spanish sub-menus opened. If you close them, then only the Arroz Con Pollo recipe will print out. I still don't like that you need to do that extra step and I'm currently looking into installing a "print recipe" button right on the blog so you guys don't have to go to a different place to print it out. Can I use frozen veggies (peas, carrots, green beans) instead?